Part of the British Territory, the Turks and Caicos Islands are composed of two islands – the smaller Turks Islands and the other larger islands being the Caicos Islands. Of the more popular destinations to arrive to by private jet, the Turks and Caicos boast a beautiful beach and crystal clear waters that are waiting to greet you as you come off your private jet after enjoying an excellent in-flight service consisting of champagne, chocolate, or a glass of wine tailored to your liking. Did you also know that the love of shellfish runs deep in Turks and Caicos and the only Conch Commercial farm has its home-base here? It is called the Caicos Conch Farm. In fact, Turks and Caicos have the fasted growing economy in the Caribbean, while simultaneously having one of the strictest controlled real estate development laws that are governed to protect the history and heritage of the islands. The islands are keen on savoring the pristine sanctuary for both locals and visitors to enjoy. There are five airports that are available for private use in Turks and Caicos. The most common of the five, and one which our clients most frequently fly into, is the Providenciales International Airport (PLS). The runway length of this airport is 7,598 feet, and is sufficient to fit a King Air aircraft or a Global Express for a more lengthy flight or higher passenger count. The airport itself has two Fixed Base Operations (FBO’s) and you can choose between the Blue Heron or the Provo Air Center to land your aircraft at. Depending on when you are looking at taking your vacation or where your resort is located, we would make sure to utilizing the most appropriate and suitable airport to meet your needs. 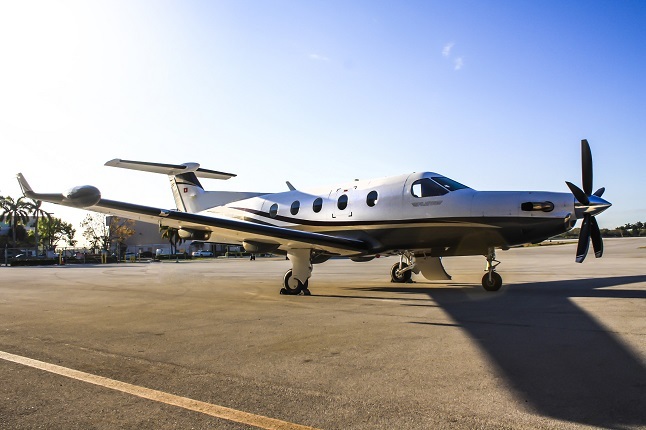 Typically, you can find a jet in every category of private aircraft on the tarmac at the airport of your choosing in Turks and Caicos. Since all airports located on the Islands have sufficient runway length to accommodate the largest aircraft, you will rarely see turboprops being the only aircraft on the tarmac. If you were to select a super mid-size jet or a heavy jet, keep in mind that these aircraft do have a flight attendant on board that would be able to assist you in serving a glass of champagne for you and your friends on the way to and/or from the islands. In regards to the proper selection of aircraft for your mission, that depends on where you will be departing from. If you are looking at a higher flight time and a nonstop option, you may want to use a mid-size jet or super mid-size jet. If you are looking for a short hop, a turboprop may be the most suitable option. Above is a table of flight times from popular departure cities in the United States.